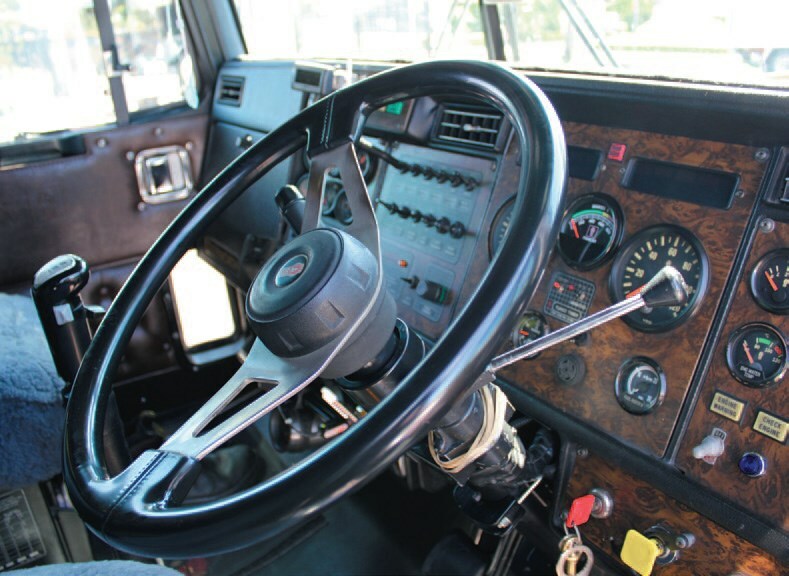 After 3 million kilometres on the clock carrying hazardous chemicals, Chris Royer’s Kenworth T950 is still going strong, as Steve Skinner discovers. The old saying "prevention is better than cure" applies to truck maintenance as much as anything else, according to Chris ‘Tangles’ Royer. Tangles’ 2000 model Kenworth T950 has been meticulously maintained, so not surprisingly it’s done 3 million kilometres and is still going strong. "I’m more than happy with it," says the Sydney hazardous goods subbie and no wonder. The only major work he’s had to do on the big banger, powered by a 600hp (440kW) Cummins Signature, is put in a new gearbox. It’s been rare for ‘the old girl’ to visit Cummins or Kenworth but Tangles hasn’t missed a 15,000km service with Fleetserve at Chullora in Sydney. "Oil changes are cheaper than engine rebuilds," he figures. Tangles (so named because of his unusual boxing and snooker techniques) is the second owner of the T950, having bought it five years ago for $150,000. The previous owner (who had two rebuilds) had recorded every single item of work done on the truck in fine detail in an exercise book, right from the first time it was greased. "Everything done to that truck is written in this book, and that’s one of the main reasons I bought it," Tangles says. "I can look back if something goes wrong and find out when it was last replaced. "I reckon it’s good to have that sort of history, it’s good to know what’s underneath your arse." 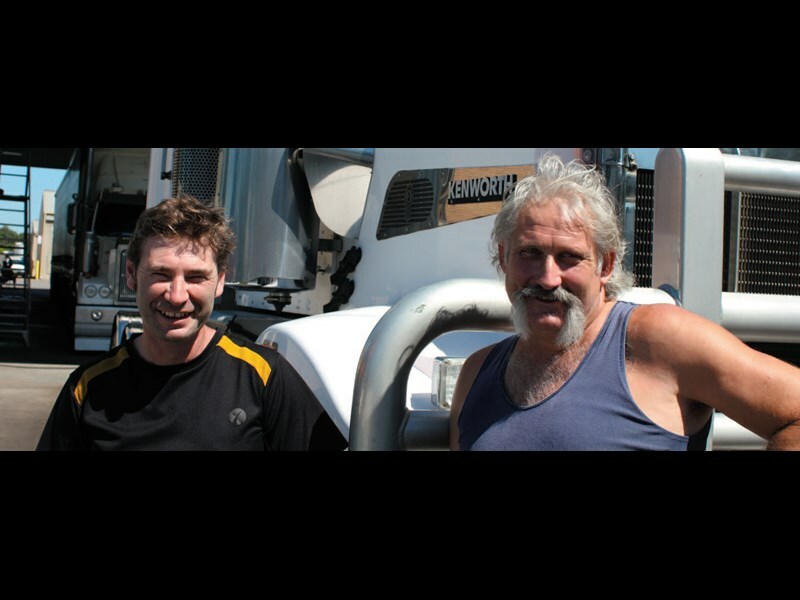 When Tangles bought the T950 he was doing interstate B-double work, but for the past few years he’s been doing local work in Sydney pulling a single trailer for FBT Transwest. He doesn’t mind that the 600 horses are a bit of overkill for a single trailer around town he’s vowed his B-double days are over, unless someone is prepared to pay him twice as much. "I don’t want to go back to doubles. I don’t believe it’s enough pay, for operators or drivers," Tangles says. "The rego costs alone are a killer. "FBT pay a good rate for a single, and it’s less headaches backing into joints and some places you can’t get in with a double so you’ve got to unhook and take them in one at a time." The big Kenworth can be a bit tricky to reverse even with a single trailer. "Backing into some places it’s a bit tight, but take your time — if you can’t see, get out and have a look, don’t go by feel," Tangles advises. The T950’s sleeper comes in handy because even though Tangles does local these days, some nights he gets back late, so he camps in the truck at the depot. The sleeper has no bunk air-conditioner but has two bunk doors to kick open. Tangles has been carting hazardous chemicals as a subbie for 25 years. When Owner//Driver asks "What sort?" he replies: "Bad stuff. Flammables, corrosives, poisons, toxic stuff, fuel." But the dangerous cargoes don’t worry him. "It’s like anything, you just do your job and there’s nothing to worry about. The only thing to worry about is idiots on the road." In fact, Tangles says an advantage of carting hazchem is that in his opinion the sector isn’t as pressured as overnight general freight. "I have never had any pressure put on me for anything," he says. He’s always loaded himself and says the worst product to load is one of the least hazardous — heavy lube oil, which might take two hours. "It goes in like maple syrup. You’re better off shovelling it in." Tangles has always been an owner-driver and says the flexibility he has allowed himself has never been held against him by his clients. "You work for yourself, you call the shots," says Tangles, who was just about to head down to the New South Wales south coast for a couple of days for a wedding when Owner//Driver caught up with him at Neal’s Transport Wash in Sydney’s Chipping Norton. "You can be your own boss, if you want time off, you can take time off. But I don’t do it for no reason, besides the wife would get on my case." Tangles’ wife Leanne does the books and pays the bills. "I wouldn’t have a clue what’s paid for what and what money goes where, she just does the lot," says Tangles gratefully. "She just tells me if I’ve overspent and I say ‘okay boss’." The big attraction of local work for Tangles is seeing his nine-year-old daughter most days: "That means a lot to me." Tangles has been there and done that on interstate. 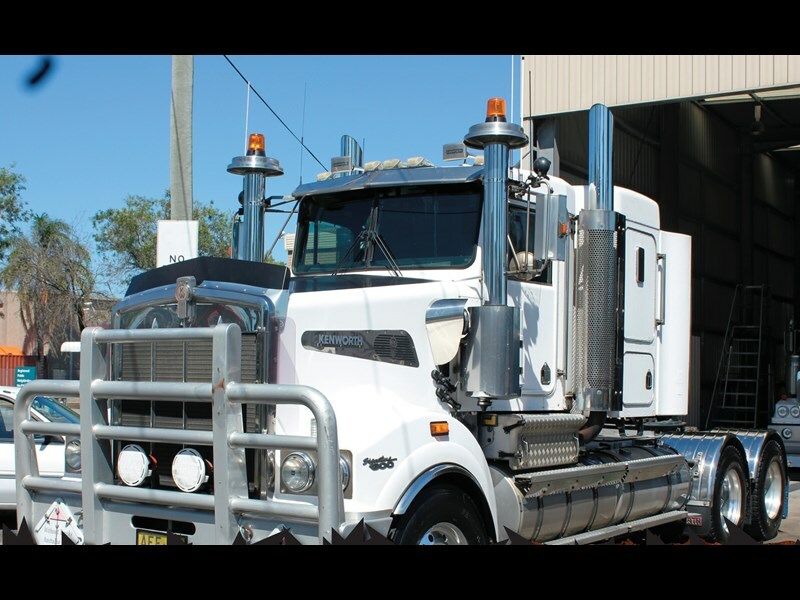 He travelled all over Australia in the 14 years he had his previous truck — a 1993 Ford LTL with a 12-litre Detroit Series 60 rated at about 450hp (330kW), all on single trailer work. "It was a great truck," Tangles remembers. "We’ve been through floods and fires and dust storms together. I loved that truck." Tangles says he doesn’t have as much affection for the Kenworth because he hasn’t shared the same adversity with it. Hence the absence of fancy lights and polish: "It’s a no-frills banger, nothing extra." "I had plenty of bling on my last truck but I just can’t see the point of it now. I’m over all that." But Tangles enjoys the "beautiful" ride in the T950. "I just like long wheel base trucks and bonnets," he says. "If something’s going to hit me, they’ve got to push that motor back before they come through the window." 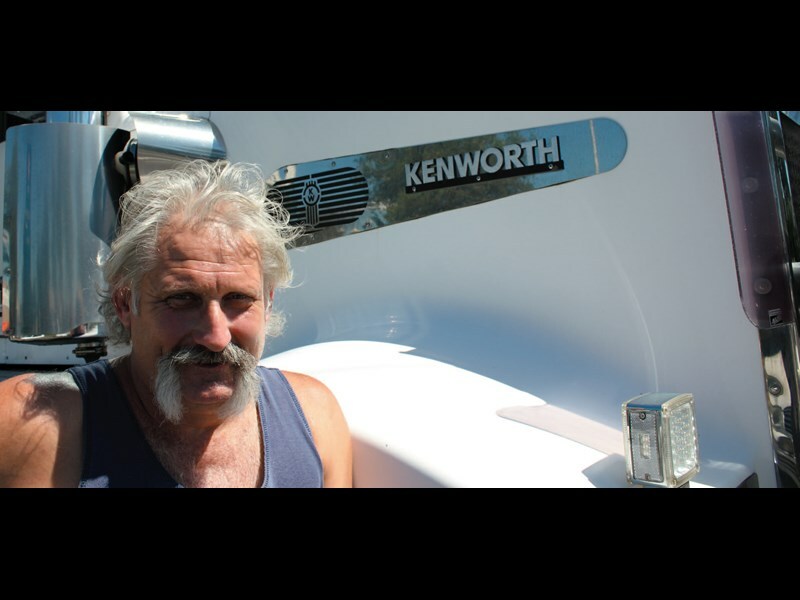 Tangles, who is only 53, must figure there are a few more kilometres in his Kenworth yet: "It will see my days out," he reckons. "I just want to retire a happy man, maybe with a couple of dollars in my pocket and a truck that’s still going all right." As everyone knows, trucking is a tough industry, but Tangles reckons the factor that could hasten his retirement is what he regards as ‘excessive regulation’. In the past few years he’s been knocked off for breaches as minor as a tail-light out, a blown headlight and a cracked windscreen. "A lot of it’s just revenue-raising and I’m just over it mate." 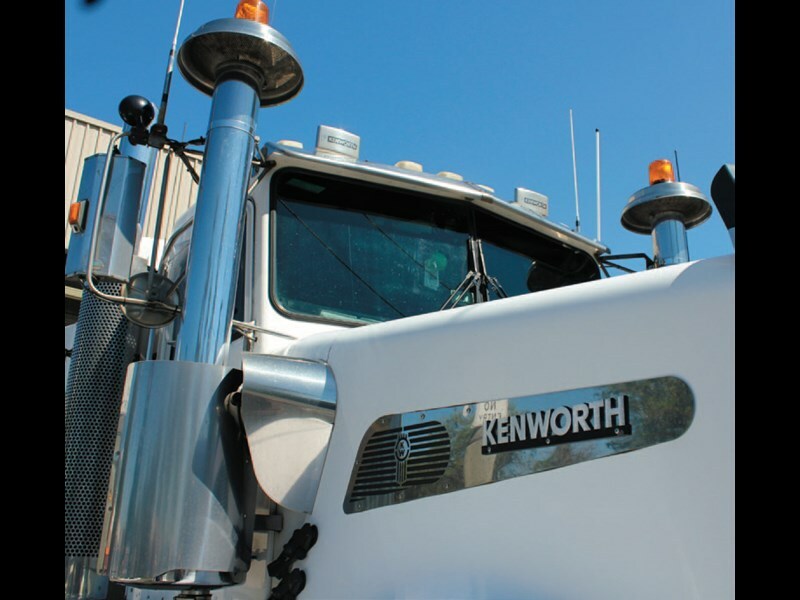 Find Kenworth T950 trucks for sale.